Jigsaw Reagan. I was lucky enough to be politically aware during all of Ronald Reagan's presidency even though it began when I was about to turn 15. Reagan had it all - conviction, eloquence, vision, fortitude, reason, wit, charisma, charm, and most importantly the critical core beliefs of conservatism. How often do you get that in a single person who also manages to reach the presidency? So far, apparently only once in my lifetime. I don't expect that number to change. Ronald Reagan was not a perfect president but he definitely was the closest we've ever seen in the modern era. There will never be another Ronald Reagan. But with a smart conservative movement, there doesn't need to be. More on that in a moment. As soon as Reagan left office his former vice president (Bush senior) began the country's march towards a less true conservatism by breaking his tax pledge. Despite the well-orchestrated, Reagan-inspired "Contract With America" put forth and acted upon by Newt Gingrich et. al. in the 1990's, the nation has stepped closer and closer towards a Bernie Sanders vision of America with each passing year. Bill Clinton gave way to George W. Bush who was by no means a real conservative and he in turn gave way to the unprepared and socialistic Barack Obama. Hillary Clinton is destined to be an amalgam of the mostly latter and some of her husband should she become president. In other words, the march towards socialism will continue unabated. The country already is unrecognizable from Reagan's time at the helm. It is only going to continue to get progressively worse (pun intended) under a Hillary presidency. Liberals will argue that the change is progress. But not all progress is good, not all change is good. Progressing towards a cliff to fall over is not good progress. What possible recourse does America have to prevent national financial insolubility, a dissolution of national values and even morals, defenselessness and a pervasive and permanent malaise? Another Reagan? Well, ya. But such a person does not exist. We can wish all we want that Ronald Reagan was reaching his potential presidency now rather than during the Jimmy Carter era, it won't happen. Reagan's time sadly for us, has passed. Frankly though, Reagan 2.0 isn't actually necessary exactly because Reagan 2.0 does not exist. Instead what we need is Jigsaw Reagan. Within many different conservative political voices we hear echoes or snippets of things that remind us of what Reagan delivered. Some of it for example, exists in Donald Trump - "Make America Great Again: is an echo of "Ask yourself - are you better off than you were four years ago?" Trump is no Reagan. He's a fraction of Reagan and not all of Trump's ideas match Reagan's vision for America. But some parts do. Some ideas we need are indeed espoused by Ted Cruz, Newt Gingrich, Bobby Jindal, Scott Walker and others. The point is that between many people in the Republican field and the Tea Party and libertarians and others the Jigsaw puzzle of Ronald Reagan exists. We can select the pieces of the puzzle we need and discard the rest - even with a Trump presidency; with others to hold him accountable we can eschew the fragments we do not need and keep the parts of Trump's platform that we do need. The NeverTrump crowd might argue that's a dangerous gamble but the bigger, more deadly gamble for America is Hillary Clinton. She's not a piece of jigsaw Reagan. She is so anathema to a Reagan vision for America, she's like throwing gasoline on the puzzle pieces and lighting a match. She's jigsaw Obama. That is the choice that is now in front of America put anywhere from 1-10 puzzle pieces of Reagan together, or set the puzzle on fire and forget that Reagan presidency altogether. In fact, never mind the Reagan vision, you can just forget the whole country. Trump is not ideal, but Clinton is poison. The longer you wait to acknowledge that fact the closer and faster America progresses towards that cliff edge. Changing your mind in late October may be too late, the damage to Trump's imperfect candidacy will be done. Sadly, you have an imperfect choice ahead, but that makes it no less critical that you choose wisely for the sake of the country. 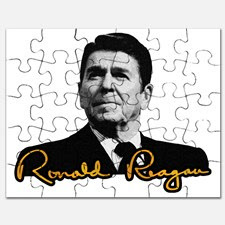 Hopefully a jigsaw Reagan analogy provides a little hope that the right piece of the puzzle is still in play even though it's not the whole puzzle.